Abstract: Apache Spark is a very popular Big Data platform. Spark’s popularity is due the fact that it is easier, more interactive and excels in in-memory computations (many times faster than MapReduce). Spark’s stream processing capability makes it a very good fit for processing ‘Connected Devices or Internet of Things (IoT)’ data. This workshop will introduce Spark to students. We will go through the Spark concepts and learn how to use Spark. Students will learn by working on hands-on labs . 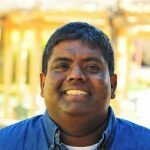 Bio: Sujee Maniyam is a seasoned Big Data practitioner and founder of Elephant Scale. He teaches and consults in Big Data technologies (Hadoop, Spark, NoSQL and Cloud) and Data Science. He is an open source contributor and author of 'Hadoop illuminated' (an open-source book on Hadoop) and 'HBase Design Patterns'. Sujee is a frequent speaker at various conferences and meetups. He also advises and mentors various firms.